Traditional Greek cooking is based on fresh seasonal vegetables, fruits, grains, legumes, herbs, spices, and olive oil - perfect for vegetarians (and often for vegans as well). Creating delicious and authentic Greek meals that meet vegetarian guidelines is a snap. These recipe favorites will get you started - and not a salad in the bunch! Listed alphabetically. This is my favorite dish. 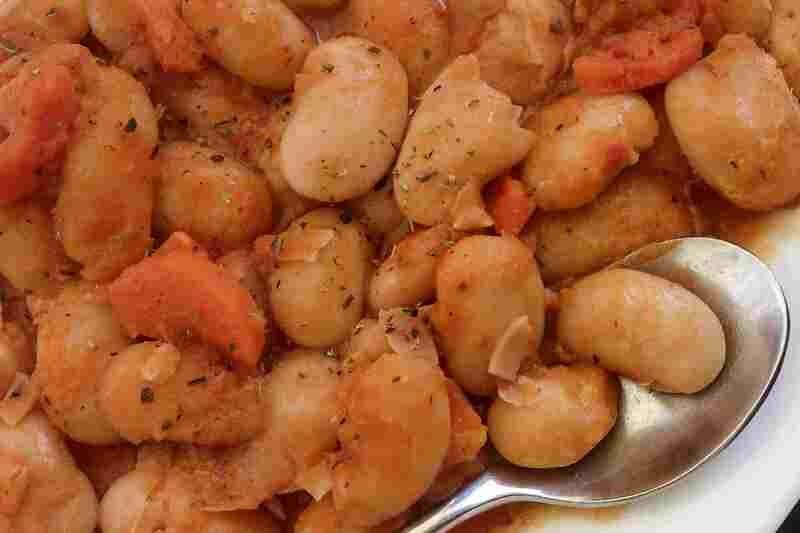 Made with large yigandes beans (or large lima beans), tomato, onions, a little garlic, and parsley, this is an oven-to-table dish that can be served as an entree, or in smaller portions as an appetizer, side, or meze. It can be fixed in advance and keeps well for a few days. Soda water in the batter keeps these thin slices of fried zucchini light and crispy. A simple recipe, serve these as an appetizer or meze , or a side dish. In this dish, the eggplant is dredged in flour and browned to a slight crisp before adding to the pot, giving the dish a lovely mix of textures and tastes. This stovetop dish includes eggplant, potatoes, tomatoes, onions, herbs, and olive oil. As simple as this recipe looks, it will fast become a family favorite. Fresh green beans, tomatoes, herbs and spices are simmered together long enough for the tastes to meld. Served in larger portions, it's a fabulous main dish. The origins of this dish can be found in antiquity. A classic Middle Eastern dish, it is a familiar sight at Greek restaurants around the world (although not in Greece). Chickpeas, tahini (a paste made from toasted sesame seeds), olive oil, garlic, and lemon juice combine to create a dip to serve before or with a meal. Spinach and cheese cooked in flaky phyllo pastry - a Greek classic and a favorite appetizer, snack, side dish, or main dish. There are several versions of spanakaopita, including without cheese, but this one is my favorite and the quickest to make. One of the easiest dishes to make, this stovetop casserole is a delicious and healthy side or main dish. Spinach, onion, rice, and seasonings topped off with the signature squeeze of lemon juice... a must for Greek veggies. If you aren't familiar with bulgur (often spelled "bulghur"), it is partially hulled wheat that has been soaked, steamed, dried, then crushed - and it can basically be used wherever you might use rice. It cooks quickly - like rice - and it has a wonderful nutty flavor. Bulgur is one of my favorite grains, and if you haven't tried it, this might be the perfect opportunity.